Those are big promises, and right out of the gate. But before I tell you if he keeps his word—before I tell you whether I’ve discovered a truth that is fundamental to all real joy—I’ll walk through the basics of his book. This is what I refer to as the ‘principle of the rope’ — the simple truth that our lives, choices, and actions are linked to the lives, choices, and actions of other people. 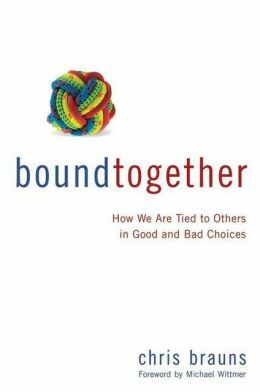 To put it simply, as I have done in the title of this book, we are ‘bound together,’ tied to others in our good and bad choices. The chapters that follow provide a clear Biblical treatment of solidarity. Original sin, Brauns’ writes, “refers to the reality that we are all bound to Adam in his choice to obey God’s command.” And while this seems like bad news—the worst of news—it turns out that it is the selfsame principle of solidarity that allows us to be bound to the second Adam, Jesus. Solidarity (which is, remember, simply the way God’s world works) makes it possible for us to be united with Christ. There now exists a life-giving union between Christ and his own that is similar to, but more powerful than, the death-producing union between Adam and those who belong to him… It means the principle of the rope, though we first experience it as the worst possible news, is ultimately good news. The principle of the rope is what underlies the good news of the gospel, namely, that if we are roped to Christ, we are so bound to him that nothing — not even the rope that ties us to Adam — can ever separate us from his love. Brauns then explores some of the implications of our union with Christ and provides the helpful clarification that we can’t blame the rope for our poor choices. This, then, is the “truth that is fundamental to all real joy”: the truth of the gospel, that we are bound to Christ, coupled with the truth that we are also bound to other Christians. In other words, we are bound to Christ corporately rather than individually. So yes, after following Brauns to the end of his argument, I agree that the truth of solidarity—with Adam, with Christ and with each other—is essential to true joy. Yet I cannot quite say that the book made me joyful. (To be fair, I’m not sure that was Brauns’ intention.) Instead, it made me feel the heavy weight of responsibility, which is, I think, ultimately a good thing. His chapters on the family, and on marriage in particular, forced me to look at my own failings in a way that I haven’t seen before, dragging them out of the lie of “poor personal decisions” and into the light of truth: My wife and two sons are roped to me in my good and bad choices in a deeply profound way—a way that goes far beyond any practical applications and into the very realities of how God’s universe works. And that isn’t something to take lightly. It’s still too early to tell, but I really do believe this is one of those few books that has the ability to help me become a better husband and father. Altogether, if I have a complaint about Bound Together, it’s that I thought the book was too short. I would’ve liked to see a chapter that addressed parenting more specifically, and maybe a more exhaustive treatment of corporate solidarity in the church. Still, the book’s brevity is plus for people who may not have the patience for a deeper dive. It’s short, accessible, powerful and clear. Highly recommended. Oh, and I should probably note that Cross Focused Reviews provided me with a copy of Bound Together for the purposes of this review. Thanks for being a part of the Bound Together blog tour.